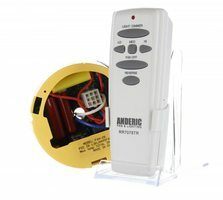 The original ANDERIC RR7078TR Reverse Remote Control is in-stock and ships within 24 hours. 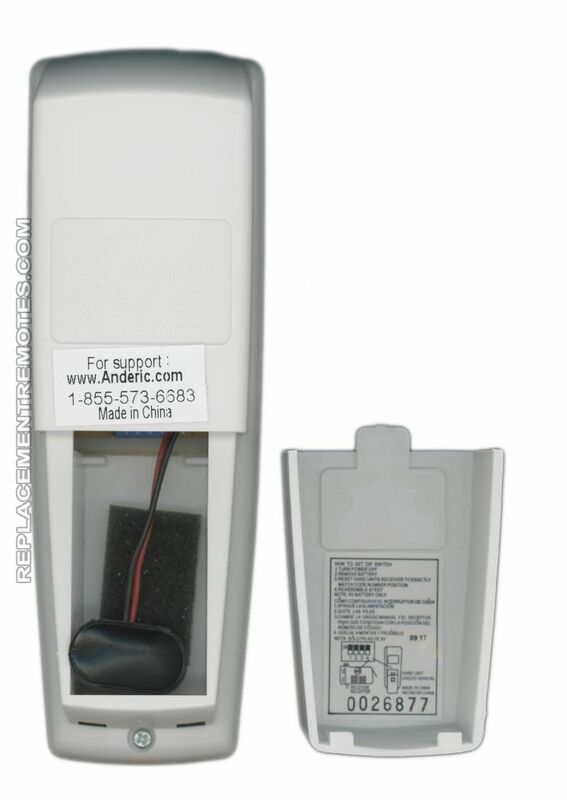 The original ANDERIC RR7078TR Reverse Remote Control carries a 1-Year Warranty. 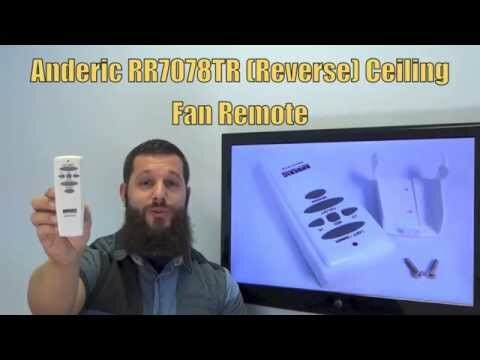 The Anderic RR7078TR remote control replaces the original equipment Hampton Bay and Harbor Breeze ceiling fan remotes. 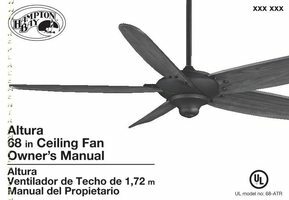 The RR7078TR will work right out of the package for compatible Hampton Bay and Harbor Breeze ceiling fan models listed (but not limited to) without any programming (other than aligning the dip-switches to the correct pattern to match your ceiling fan receiver). This remote includes all the fan speed and light buttons as well as the REVERSE button. The RR7078TR remote also works light dimming. This remote comes with a manufacturers 1-Year Replacement Warranty. by Melissa on August 02, 2018. I love this remote. The buttons on my original remote had been pressed so much they were completely worn out. I didn't know it was possible to replace the remote. My ceiling fan is probably about 13 years old. When it arrived. I read the instructions and discovered I needed my old one to set the inside switched of the new one. I panicked because I thought I had thrown it away, thinking I had to replace the entire ceiling fan. Lucky for me, I found it and was able to set the switches correctly in the new one. It worked perfectly as soon as I hooked up the 9-volt battery that I ordered with it. It was sent to me in a week's time. I have gone without my ceiling fan for 3 years. I wish I had known about this a lot sooner. by Nora on September 10, 2016. Worked PERFECT right out of the box. LOVE IT ! by Carl on April 19, 2019. I was really pleased to find this replacement remote. My ceiling fan was old but it works fine, the remote had just worn out. This replacement worked perfectly! by Chris on April 09, 2019. Easy to set up. Perfect replacement for old remote. Saved our 20+ year old Hampton Bay fan, which still works great. by Mindy on April 05, 2019. It works perfectly ! Thank you! by Joanne on April 03, 2019. Customer service was very helpful in quickly talking me through how to sync my new ceiling fan remote to my fan. The remote I bought from them is way better than mine and now I'm actually glad my original remote broke. My previous remote only had an on and off button for the fan light and the light was very dim and essentially useless. This new remote I noticed has a dimmer button and out of curiosity I held down the dimmer button. To my shock, after 15 years of owning this fan, the light brightened up like ten times brighter illuminating the entire room the way I had always wished it did. I had no clue this light was capable of being so bright! by Heriberto on March 29, 2019. Worked as advertised on a hunter fan. by charles on March 29, 2019. Needed replacement remotes for a home I'm selling. Searched and found these. Ordered them, got them promptly, and gave them a try. Worked perfectly! Solved my problem and very happy with company and product. by Gary on March 28, 2019.
by Mark on March 24, 2019. Very easy, just put batteries in and pushed buttons and everything worked. by Loyal on March 23, 2019.
by Dan on March 22, 2019.
by Donald on March 19, 2019.
by Joseph on March 04, 2019. I initially ordered one remote, to make sure it worked with my older Hampton Bay fan/light. It was very easy to program to the existing fixture, and works great! Consequently, I ordered two more. I'm SO pleased with this product. And shipment was very expedient. Thank you! by Gretchen on March 03, 2019. Got it and immediately it worked. That simple. by Curtis on March 03, 2019.
by Marsha on February 22, 2019.
by Elizabeth on February 11, 2019. Thank you for a quick turn around on my replacement remote controller. by Murray on January 28, 2019.
by Laura on January 21, 2019. Works perfectly. Thinking about replacing other fan controls before they go out. Price was reasonable and this product solved the problem. by Caroline on January 17, 2019. 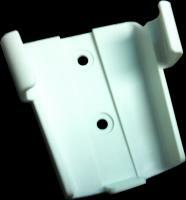 This item works great with our Hampton Bay ceiling fan. by Margaret on January 17, 2019.
by Don on January 14, 2019. Such a pleasure to walk into a room and have instant response. Quality material,quality workmanship held comfortably in your hand. Couldn't ask for more. by Beatrice A on December 30, 2018. I am very satisfied with the RR7078TR remote. On my old remote it was very difficult to get the light to turn on or off. With the new one it is almost effortlessly. by Tim on December 28, 2018.
by Bruce on December 23, 2018.
by Sergei on December 20, 2018. Fabulous right out of the box. Finally was able to replace a worn out original remote for my ceiling fan. Thank you. I bought two. by dorothea on December 17, 2018.
delivered quickly and works perfectly!!!! by NINA on December 17, 2018. Works perfectly...just popped in the included battery and instant functionality! by jeffrey on December 15, 2018.
by peter on December 15, 2018. Worked perfectly right out of the box! by Joseph on December 14, 2018.
by brian on December 11, 2018. It's great! Delivered quickly, easy toinstall & works great! by Mary on December 10, 2018. This is a piece of junk. It would not work with my Hunter Fan.don't buy. by Ernest on December 10, 2018.
by Scott on December 06, 2018. Arrived on time and worked perfectly without having to do anything except put in the batteries. Happy as a clam! by JAMES on December 04, 2018. Excellent product!! It arrived in a timely manner and works even better then the original remote!!! I would definitely purchase from this Seller again! by Donald on December 03, 2018.
by Maria on November 26, 2018.
by elizabeth on November 24, 2018.
by Scott on November 21, 2018.
by John on November 21, 2018.
by John on November 20, 2018. Does not work. A waste of time & money! by Ellen on November 15, 2018. Thank you thank you. After running from store to store and searching the internet I found Replacementremotes. The remote I purchased works perfectly. My client (I'm a realtor) thinks i'm a star. Her ceiling fan only functions with the remote. It is wireless. After this I want a wired fan only. But thanks. She is happy and I am happy. What a blessing. Thank you again and again. by Mildred on November 09, 2018.
by John on November 05, 2018.
by Paul on October 31, 2018. Doesn't work with my fan. by Mark on October 31, 2018. Remote worked perfectly right out of the package. All functions worked with my wireless fans and lights. The only slight difference from the original remote was the lack of a dimmer function, however I seldom used it so it doesn't really matter, and it could just be a setup issue. I am very satisfied with the delivery, quality and price of the remote. by James on October 30, 2018.
this item was perfect. arrived very quickly, very pleased with the price also. by Yevonne on October 21, 2018. This worked perfectly right out of the box, even adds a dimmer for the light, which the original remote did not have. 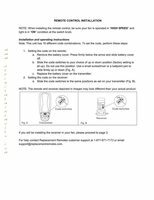 One correction to the instructions: it is not necessary to look at the switch settings on the receiver (which is up in the fan itself)--the old remote has the same set of switches, and you just need to set the ones on the replacement to the same settings. The switches on the old remote are easily visible once you remove the battery cover and the battery. Nice product, and less expensive than either a factory replacement or some of the other universal remotes on the market. by Michael on October 13, 2018. Perfect replacement! Slightly better than original. by John on October 07, 2018. Couldn't even push the buttons on mine anymore; was SO frustrated. Ordered this remote, put a battery in it and IT WORKED!!!! So much in love with my "new" remote. I can even turn on the LIGHT! Before, I was lucky if I could get the fan going with my old remote. BEST PURCHASE EVER!!!!! by Dawn on October 03, 2018. Arrived very quickly, only 3 days and works perfectly.Very satisfied. by robert on October 03, 2018. Remote was fine, had to replace the receiver. As Advertised. by Stephen on October 03, 2018. 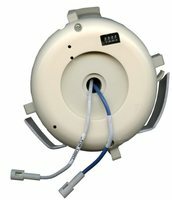 This is a perfect for non-existing Hampton Bay Ceiling fan, light, reverse (UT7052? I guess). I took a chance and ordered it - hoping it works. To my surprise they had instructions as well. I did not do much to the settings - looked at old remote and saw the setting pins and aligned the same on new one. Wow - the light worked on my first try. Next Fan - wow that worked, now fan Hi that worked, next lo that worked. Tried all other settings in less than 3 mins which includes replacing a new battery, all buttons. Cannot be happier. Thanks once again making this replacement. by Tahseen on October 03, 2018. Received the remote on time but only works on MED not on High or Low so don't know if it is the remote or the fan. The light works perfectly. by Richard on September 21, 2018.
by Madeline on September 21, 2018.
by Rodney on September 17, 2018. Worked well, and is actually better than the lost original! by Bob on September 16, 2018.
by Betty on September 13, 2018.
by Blair on September 10, 2018. Worked great right out of the box. We moved into a house with fans on the patio but no remote. by David on September 09, 2018.
by Jacqueline on September 09, 2018.
by Ronald on September 08, 2018. Received very quickly and works as expected. by Dave on September 07, 2018. It came very quickly and programmed as easy as the instructions said it would. What's not to like. by Frances on September 07, 2018. Works well out of the box. No programming needed. by Samuel on September 05, 2018.
service has been great! I have ordered 4 replacement remotes at different times and all have been shipped on time and in perfect working condition. by Olga on September 04, 2018.
works great . had bought one 3 yrs. ago. by dennis on September 03, 2018.
by Mary on September 03, 2018. On a scale 1-10, I give it a BIG 10. Could not be happier with delivery and ease of use. Thank you very much. Five star rating all the way. by Richard on August 16, 2018. Excellent. Worked on first try. by Anita on August 16, 2018. Does everything as advertised. Easy to configure. by Mickey on August 14, 2018. It works better then the old one. Your website made it so easy to find a replacement. Thank you! by Glenda on August 13, 2018.
by Kevin on August 13, 2018. Very satisfied with both the product and the service. I purchased three of these as replacements for the Hampton Bay originals which had only intermittently functioning buttons. The Anderic replacements arrived promptly and worked perfectly right out of the box (after code matching them to the respective ceiling fan receivers in each of the bedrooms). They look better than the originals, and the button size and layout make them infinitely more user friendly as well. A good value for the money. by Michael on August 10, 2018. I liked that they had a picture of the remote this one replaces so I was sure it was the correct one. I found then using the circuit board ID which was great because my old case was smashed. by Matthew on August 08, 2018. Really good, but the sensitivity of the buttons is not great. I have to press it with a bit of pressure that scares me as to their longevity. by Suki on August 07, 2018.
by tracy on July 31, 2018.
by Richard on July 30, 2018. I am so happy with my new remote!! by Lori on July 29, 2018.
by Luis on July 26, 2018. Got here promptly and works perfectly!!! by Catherine on July 26, 2018.
by Martin on July 24, 2018.
by Davelyn on July 24, 2018. Easy to order. Works great! by Martin on July 23, 2018.
by Diane on July 23, 2018. Absolutely perfect.No problems.Better then the original. by Lowell on July 22, 2018. It was the correct unit for both my older Hampton Bay fans that use a 9 volt battery. It saved me time and money because I was looking at replacing the remote controller unit inside the fan using the new 4.5 volt remote or installing new fans. I was not happy with either option. Finding these remotes saved me a few hours and money. Thanks again. Just a note I do have newer fans using the 4.5 volt remotes and tried all the possible code configuration but nothing worked except these replacement remotes. by Dale on July 22, 2018.
by brett on July 21, 2018.
by Bradley on July 21, 2018.
by Richard on July 19, 2018.
by rommel on July 18, 2018. Works great, once I matched the dip switch. by Jay on July 18, 2018.
by SCOTT on July 18, 2018.
by Penny on July 17, 2018.
by John on July 17, 2018.
by Jonathan on July 16, 2018. Works perfectly!! Saved us from having to get a new fan!!! by Anne on July 16, 2018. Easy to set up. Worked immediately. by Michael on July 15, 2018.
by William on July 15, 2018.
by James on July 15, 2018. The vendor shipped the replacement remote control on time and it was packaged carefully so that it arrived in tact. The remote is easy to use and functions as intended. Thanks. by Michelle on July 13, 2018.
by Connie on July 12, 2018. Works perfectly right out of the box! by Douglas on July 12, 2018.
by Linda on July 12, 2018. I bought 2 remotes to replace the ones that stopped working. As soon as I set the code they worked perfectly. by Linda on July 11, 2018.
by Robert on July 11, 2018.
by Randy on July 10, 2018. I would do business with you again , very helpful in me finding the right remote . I appreciate your service . Thank you and GOD Bless ! Benorce Blackmon , A very satisfied customer. by Benorce on July 10, 2018.
by Edwin on July 10, 2018. Excellent replacement. Will order more! by Marcus on July 09, 2018. Exactly what I was looking for. Works perfectly. by Douglas on July 09, 2018.
by Sheila on July 08, 2018.
by marvin on July 04, 2018. Product works great with my existing ceiling fan and light package. No compatibility issues at all. Arrived on time and in excellent condition! by WC on July 04, 2018.
by james on July 04, 2018.
by james on July 03, 2018.
by FRED on July 01, 2018.
original remote wasn't responding when the buttons were pushed or you had to push really hard and hold the button down. Found this Anderic replacement. Pride was reasonable. Delivery timely Unscrewed old wall holder, attached the Anderic holder, put in a battery set the code using the old remote and we were up and running. Works like it is supposed to. A minor miracle in today's world of gadgetry. by Tom on July 01, 2018.
by Dawn on July 01, 2018.
by Allen on June 30, 2018.
by Barbara on June 29, 2018. Great replacement. Works and right out of the package. by Helen on June 29, 2018.
by Chiuoan on June 28, 2018. Works better than the original! So happy to have found this option than to have to replace the whole ceiling fan and light. Worked right out of the box. No programming or other types of installation steps required. by Mary on June 10, 2018.
by Alwin on May 29, 2018. Reasonably price. Works as good as new. What more can I ask? by Spring on May 20, 2018.
by Jack on April 20, 2018. Perfect...easy to configure works great! by Diane on April 18, 2018. A perfect replacement remote for my fan! by Steven on February 28, 2018.
by Michael on February 04, 2018.
by Mark on January 27, 2018. ITEM WORKS BUT THE RANGE IS NOT AS CONSISTENT AS THE ORIGINAL REMOTE. by Victor on January 27, 2018. Very simple and straightforward to set up. It just works! by Richard on January 25, 2018.
by richard on January 11, 2018. This remote works better than the original that came with the fan. I would definitely buy this again when one of my other remotes breaks. by Victor on January 11, 2018. I called and gave the person the model number on the remote and he said I know what you need. It was sent quickly and it works perfect. I called them to thank them. by richard on November 30, 2017. I would have given 5, but the battery connector is of a type that I have had problems with before. The remote works great, and replacement was easy. by George on November 30, 2017. Great product. Fast service. Works great. Thank you. by Jayme on November 25, 2017.
by Cesare on November 20, 2017.
by Gerald on November 20, 2017. Love everything about it. Easy to program to my fan and everything works great. by Sharlene on November 17, 2017.
by AGUSTIN on November 16, 2017.
by Brian on November 10, 2017. Thdese remotes function like the orignal. My fans do not reverse. by William on November 01, 2017. Works perfectly for an outdated ceiling fan. Delivery was immediate! by Jeanine on October 31, 2017. Better than the original remote..
by Martin H on October 31, 2017.
by Henry on October 09, 2017.
by Tom on October 03, 2017. Put battery in and it worked perfectly. Nothing to do but turn it on!! Very pleased. by Roger on September 19, 2017. Works perfectly! Very happy with my purchase. by Linda on September 18, 2017. Very glad that I was able to get a replacement remote. It works just fine. by Jane on September 15, 2017. Perfect. Easy to activate and works well. by Joseph on September 15, 2017. I like the grip of the thicker remote. The speed controls low med high go from left to right. Works great. Using it as a second remote. by Scott on September 08, 2017. Works like the original. I liked purchasing from this company whom I can call if I have a problem and perhaps rectify it over the phone. You cannot do that if purchased at Amazon (or at least very easily). by William on August 29, 2017. Perfect, works just like the original remote. I am very satisfied with your product. by James on August 28, 2017. It definitely works but you have to mess with the dip switch in order for it not to control the other fans as you did when originally bought the fan. So yes, it is equal to the old remote. I think our light bulbs are dead because the light did not come on when pressing the dimmer, but will be changing the bulbs just in case. I am happy that we are now able to turn the fan on and off etc!! Thank you. Good product - would recommend for sure. by Diane on August 21, 2017.
by Douglas J on August 20, 2017.
by Louis on August 19, 2017. I'm so freaking glad I found this site. Mom in law bought house. Ceiling fan in side room. No ropes or chains. Nothing. Hot as hell in the room. Got the model number...BAM! Ordered it and done! Good price and fast shipping. Slap a 9-volt in there...Ramma Jam BAM! Serious windage! Thanks! by Bradley on August 18, 2017. This is really a nice remote. I wish Regency came with one this nice. Only one drawback is that my fans have an up light and a down light. This remote only controls the Down Light. Love it anyway. Also, fast shipping. by Robert on August 18, 2017. Worked as advertised. Getting ready to order another one to replace my last 22 year old (original) remote control. by ISMAEL on August 16, 2017.
by Hans on August 10, 2017. Just like the original !!! by little on August 07, 2017. I like it a lot. Could not find one in the big box stores.it is better than the one that came with the fan. by Paul on August 03, 2017. Excellent remote - just as good as the original. by Efrain on August 03, 2017. I received the ordered items in record time , in fact quicker than stated time ..my only observation ls that,on the packing list it shows the price of the items as 5 dollars each and postage 31 dollars. Total. 46 dollars. I paid 90 . Any comments ? by Raymond on July 31, 2017.
by Cindy on July 25, 2017.
by Tobias on July 19, 2017. I liked the new remotes. They were easier to use than the ones that came with the ceiling fan and were very easy to program. My only complaint is they came with no instructions and I cannot use them on the ceiling lights. At least my ceiling lights still can work manually. by Geraldine on July 16, 2017. Arrived earlier than expected. Works well! by Mona on July 15, 2017.
by mark on July 14, 2017. Perfect! First time out of box worked like original. by Timothy on July 13, 2017.
by Jay on July 12, 2017. Thanks for providing this remote. My house is cooler and more comfortable. by Mark on July 11, 2017. Works perfectly! Glad to save the hassle of a new receiver. by Leha on July 10, 2017. Beautiful remote works perfectly! Thank for your prompt service! Gray product! by John on July 07, 2017.
by Patricia on July 07, 2017.
by Luis G on July 07, 2017. Works exactly as expected. Up and running in under a minute. by Stephen on July 04, 2017.
by John on July 03, 2017.
by harold on July 03, 2017.
by Richard on July 02, 2017. Works like the factory one did. Set the 4 dip switches and back in business. Well worth it. by Jason on July 01, 2017. Excellent products. Work better than the originals. Thank you very much. by John on July 01, 2017.
by amina on June 30, 2017. 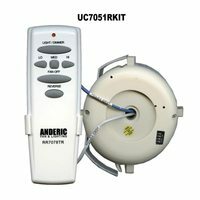 The Reverse Remote Control ANDERIC RR7078TR it is the Best Replacement for Old Fan & Light Control , Best Quality , easy to use , I just setting the Code Switches what the Operating Instructions said and Working Perfect ! . It was Shipped via Standard Shipping in two ( 2 ) days , I am Very Happy with this Company , it is the Best on the Market ! . by Nicolae on June 28, 2017.
by Mike on June 25, 2017.
looks like it'll be fine. waiting for handyman to set it up. by stephanie on June 24, 2017. Easy Ordering, Fast delivery and it works like a charm!! by Rosanne on June 23, 2017.
received on time as advertised. by Carl on June 23, 2017.
by Artur on June 22, 2017. 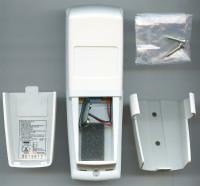 We are very happy with this remote as a replacement for a Hampton Bay ceiling fan. It is working great! by Marie on June 21, 2017.
by Colleen on June 20, 2017. Works the same as my old remote. Just put in a new battery and good to go! by Mary on June 19, 2017.
by Allan on June 19, 2017.
by Lynn on June 18, 2017. Received my replacement remote in a timely manner. Put batteries in the remote and am now finally able to turn off my light and use my fan. Extremely happy that I did not have to purchase a completely new ceiling fan/light for my bedroom. Would recommend this company and this replacement remote when needed. by Helen on June 11, 2017. EXCELLENT REPLACEMENT, WORKED RIGHT OUT OF THE BOX. ONE OF THE BEST CHOICES I HAVE EVER MADE! COULDN'T GET ANY EASIER TO USE. THANK YOU . by charles on June 10, 2017.
by Patrick on June 07, 2017. It worked exactly as they said and as it should! by Carmen on June 05, 2017.
by jay on June 05, 2017.
by Gene on June 05, 2017.
by Ursula on June 05, 2017. Very easy process to order and it arrived and works like a charm!! by candy on June 05, 2017. Worked great the first time I tried it. by Gerald on June 05, 2017. Great product. Easy to use, function very well! I love it! Thank you. by Amelia on June 04, 2017. This replacement remote works great for my Hampton Bay fan. It also saved me from having to replace the fan which is close to 20 years old. by Sonia on June 01, 2017. Worked great .. my Partner said it wouldn't.. it worked GREAT , fast shipping .would use again , got thoose older fans ..why replace ,when you can get great brand new remotes .. reuse don't rebuy ..
by Barbara on May 28, 2017. Oh my goodness!!! I haven't had a remote for my fan in 3 years!!! How wonderful to have one! by Glenna on May 25, 2017. Very satisfied. Easily replaced the old wall caddy with the caddy that came with the new remote, which I like better. Then put in a 9 volt battery (not included) and pressed the on button. Works perfectly. by sandra on May 24, 2017. Worked perfectly out of the box. by Alfonso on May 23, 2017. Love my new remote! It works perfectly and makes life easier . . . especially after my 1-year-old grandson chewed on the original one and broke it! If you need a remote replacement, this is the place to get one! by Joyce on May 23, 2017.
by Larry on May 22, 2017. Very easy to program and it works great. Absolutely no problems. by Edmund on May 17, 2017.
by Raul on May 17, 2017. Works well f!!! 4 Stars !!!! by Richard on May 17, 2017.
by Donna on May 16, 2017. Great product!!! Quick delivery, the remote,is just what I needed !!!!! by Giacoma on May 15, 2017. Exactly what I was looking for. Delivery time was excellent. Very satisfied. Thank you. by Gilberto on May 14, 2017. They work perfectly! I'm certainly a satisfied customer. by peter on May 13, 2017.
by Peggy on May 12, 2017. Perfect replacements for original Hampton-Bay remotes. Worked immediately after setting the dip switches in each. by Graham on May 09, 2017. Works as advertised. Shipping and price not super but not bad. by Jonathan on May 09, 2017. It was like a miracle when we received the remote. We opened the box, placed a battery in the unit and pressed the light and when it came on we literally jumped up and down we were so happy to have the light/ceiling fan working in our dining area. THANKS!!!!!!!!!!!!!!!!!! by Carolyn on May 09, 2017. Worked right out of the box (after I put in the battery). Arrived fast. Great product and service, thanks. by Diane on May 08, 2017.
by Charlie on May 08, 2017. Service was very quick! Remote works wonderfully. Thanks! by Jan on May 08, 2017.
by john on May 07, 2017.
by Dianne on May 02, 2017.
by Alvin on April 30, 2017. This worked great! Very happy. by Jennifer on April 29, 2017. This remote is identical with the original remote. It operates perfectly. I'm very happy with my purchase. It's like having a new fan. by Michael on April 27, 2017. Other than the dip switches being set in reverse, :) These are the best replacements from the original remotes I've seen. Several people have told me they love the new remotes. They work great. by David on April 27, 2017. Excellent fulfillment - prompt and hassle-free. by ROBERT on April 26, 2017.
by Lynne on April 24, 2017.
by Jeanne on April 22, 2017.
by JeanLuc on April 19, 2017.
by Manuel on April 16, 2017. The new remote works perfectly. by Bonnie on April 16, 2017. Worked great, right out of the box!!! Just had to match up the switches to the old remote and it works perfectly. Very satisfied! by Donna on April 16, 2017.
by William on April 14, 2017. It is working just the way it is supposed to. I am satisfied with this product. by Laurel on April 08, 2017.
by Charlene on April 07, 2017. Easy to operate right out of the box. by Brandon on April 07, 2017. So far so good. This remote does what it should. Shipping only took only a couple of days. by Eric on April 05, 2017.
by Benjamin on April 05, 2017.
by Douglas on April 05, 2017. Worked perfectly from the moment it was received. Excellent service! by Connie on April 04, 2017. Great product. Works better than new. by Frank on April 02, 2017. Looks and works just like the original remote. by Robert on April 02, 2017.
by Victor on March 29, 2017. So far, so good. Upon arrival, pretty much all I had to do was slapped a new 9V battery into the remote. No need to program it, as it was already set-up. Lights, on/off, and fan speed work easily. 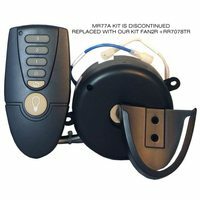 Great replacement remote from Replacement Remotes.com!!! by Mark on March 27, 2017. Fine job. Works great right out of the box. Thank you. by THOMAS on March 27, 2017. I am completley thrilled with these remotes. The fans are twenty years old. I spilled water on one of my remotes, and When the other remote wore out, I thought I would have to replace the fans, never expecting to find replacement remotes. These work beautifully and now the fans will probably outlast me. Thank you. by Pat on March 27, 2017. The unit came ready-to-use! We didn't have to program anything it worked right out of the box! It was great! Thank you! by Rosemary on March 25, 2017.
by sharon on March 25, 2017.
by Robert on March 25, 2017. Easy set up and works from anywhere in the room. Quick response. by George on March 24, 2017.
by M. on March 23, 2017.
by raquel on March 22, 2017.
by Alice on March 21, 2017. This remote works perfectly with the Hampton Bay ceiling fan that I have. by Kellie on March 20, 2017.
by Tammy on March 10, 2017. Better than the original remote. by daniel on March 09, 2017.
top notch you guys rock!!!!! out of the box installed battery BACK in bussiness graet!!!! by dave on March 08, 2017. Arrived earlier than expected and worked right out of the box. Great customer service. Thank you! by Sharon on March 06, 2017.
by Yusri on February 26, 2017. All I had to do was put in the batteries. Since I never changed the setting on my fan I didn't even have to adjust the setting on the remote. Works great! by Lois on February 18, 2017. It is working great so far. Just put in the battery. fan & light works!! by Tex on February 17, 2017.
by Dawn on February 15, 2017. I worked right after I put the battery in. by Kathy on February 14, 2017. Works well. Nice newer design. by Jeff on February 11, 2017. Gone are the days of slapping my old remote to make it work, because this new remote works perfectly. Thank you. by SIDNEY on February 10, 2017.
the product performs great, the holder of the remote should cover the outlet box as the product that came with the fan. by cornell on January 31, 2017.
by thomas on January 23, 2017. Works great. Just put in batteries and it worked like a charm!!! by Maureen on January 16, 2017. Works perfect for my fans. Thank you! by Chad on January 16, 2017.
by Beth on January 15, 2017. I could not find the direct replacement. This one is the advertised replacement for the original. I had to mount the holder (included) separately from the original holder, but that's no big deal. Just a couple of screws. The remote works great. Now I can turn the light on and off on the first try. The fan control on the original remote still works so I now keep it on the nightstand so I can turn the fan on & off without having to get the remote that is mounted to the wall. Completely satisfied. Glad I found this. by Carl on January 10, 2017. My Mom was about to replace two fans but it turned out that only the remotes had died. It's strange that two remotes failed within about 5 days of each other, but that was the case. These replacement remotes got her back in service and the price was exceptional. by Brian on January 08, 2017.
by Brian on January 02, 2017. Unit is easy to program (only 4 switches to match to original). All functions worked at first attempt. Quality materials and a handy hanging bracket which included screws and wall anchors. Very pleased with unit and order was shipped and received quickly. by PETER R on December 30, 2016. Button layout and operation is the same as the original, you will not be able to tell the difference. Reasonably priced, and it took two minutes to install the batteries and set the code to make operational. by Walter on December 27, 2016. Works better than the original. Great value and great remote. by Gerard on December 19, 2016. We are very happy with this remote. It arrived quickly. We were worried it wouldn't work with our ceiling fan, but to our amazement, it worked the first time! We are thrilled with it. by Thomas on December 18, 2016. The fan/light work as well as they did when we first bought it 20 years ago. It's nice to have the light turn on with 1 light push of the button after years of struggling with an old remote. by Richie on December 17, 2016.
by Gerald on December 15, 2016.
by Wayne on December 11, 2016.
by BARBARA on December 11, 2016.
by Jeffrey on December 09, 2016.
by james on December 07, 2016. Order was delivered so fast. Remote so easy to program. Great! by Bonnie on December 03, 2016. The controls work beautifully. I was concerned at first because my fan and light unit has been around for a lot of years. I am very pleased with my purchase and would recommend it to others. by Lewis on December 02, 2016.
by Greg on December 01, 2016.
by Connie on November 29, 2016.
by James on November 07, 2016.
by Wayne on November 06, 2016.
by Linda on November 06, 2016. Excellent product. Probably better than the original & has a reverse remote function for those fans equipped with that remote function. easy setup with a ballpoint pen and 9V battery. by AGUSTIN on November 03, 2016.
by marian on November 01, 2016.
by Michael on October 28, 2016.
by Elvira on October 24, 2016. Very easy to install. Excellent product. by Robert on October 23, 2016. Nice product. Came automatically set to our fan, even though the instructions stated how to set it. Buttons work great. Easy to cover previous holes in the wall for old remote holder, no problem there. by DIANE on October 16, 2016. So happy to have found this! Our kitchen remote control had been going out for a long time. You have to press the light button for a long period of time and wave it around to get the light to come on. Well, one day I thought, how ridiculous! There must be some kind of replacement remote because we didn't want to have to replace the ceiling fan. It's old, but in great shape. I found this website when searching. The reviews were really good. One review in particular said to hang on to the old remote because there is a code box inside it, so when you get the new one, you'll open it up and program the 4 buttons to match the old remote. What amazing advise. I wouldn't have known how to do that had someone not posted that review. So anyway, we received the replacement remote and already knew the code to set it to and it worked beautifully right away! I could be happier with this company offering these replacement remotes. It's more than worth the $20 bucks it costed! Now we don't have to buy a new ceiling fan, nor install it! I will use this company again when I need a remote and will highly recommend it to others. by Diane on October 11, 2016. Great product. Worked as soon as I installed the battery. Great service. Will definitely use you again. by Sheldon on October 09, 2016. Thank you. Great to find replacement for my fan. by Patricia on October 04, 2016. It worked great out of the box, no problems. by Paul on September 27, 2016.
by Theresa on September 15, 2016.
by Roy on September 07, 2016. Work perfect . So happy with my purchase!!!! by Rosalba on September 06, 2016.
by Victoria on August 31, 2016. Excellent remote!! Works better than the original,obsolete remote ever did !!! by Dawn on August 31, 2016.
by James on August 29, 2016.
by Timothy on August 29, 2016. Works great. Very happy with this product. by Peter on August 23, 2016. Works fine. The reverse feature doesn't work, but that may be an issue with the fan. Took 2 weeks to get it but worth the wait. by Duncan on August 22, 2016.
by henry on August 22, 2016.
by John on August 06, 2016. Works great. Great buying experience. Will buy again. by Kamran on August 01, 2016.
by Connie on July 31, 2016.
by Curtis on July 26, 2016. Product shipped promptly, was as advertised, and worked perfectly. by Don on July 21, 2016.
by Ira on July 16, 2016.
by sam on July 16, 2016.
by Noel on July 15, 2016. We were thrilled to find a remote that is EXACTLY the same as the one that quit working. It works exactly like the other one after we set the switches inside to match. Sure, the name on the outside is different, but who cares?!? And it cost a lot less than the "universal" remotes for sale at the home/hardware stores. Plus, we didn't have to climb up there, tear it apart, and install a new unit to work with the "universal" remote. We are disabled, so that wasn't an option for us. We also didn't mind the shipping cost as it was quite fair. The shipping did take a couple of days extra, but there was a national holiday in the middle, so it was probably due to that. Even on the website, it was easy to find what we were looking for. We will be back to www.replacementremotes.com if we ever need another remote replacement! by Jacquie on July 13, 2016. It worked right out of the box without any need to modify the position of the dip switches (the fan was in its default configuration). Thank you. by Jesse on July 08, 2016. This product is compatible to the old remote I had but in a more modern style. It works great! The website where I ordered it from, replacementremotes.com is an excellent site and has a tremendous inventory! by Linda on July 06, 2016. Purchase 4 controllers, they all work great even with fans from different manufacturers. Thanks! by John on July 01, 2016. It worked perfectly and it was received when promised! by Julie on June 26, 2016.
by John on June 23, 2016. Excellent! Received in time frame given, not sure how to do the code, but copied from previous remote and works great! by Luz on June 22, 2016.
by Adam on June 22, 2016. Wonderful !! It really works!! by Lori J on June 21, 2016.
was easy to program works awesome without it could not turn light on. by Melissa on June 20, 2016.
by Ercel on June 19, 2016.
by joe on June 17, 2016. Great remote. Worked right out of the box after inserting battery. by Paul on June 17, 2016. They arrived quickly and worked perfectly. No longer have to fight with unresponsive buttons. I should have done this sooner. by Christopher on June 17, 2016. Works perfectly with my older fan. by Michelle on June 16, 2016.
by JULIA on June 15, 2016. I ordered 2 replacements remotes. They both work perfect! I am so happy to finally be able to use my fans again! by josef on June 15, 2016. Thank you, it works great, as soon as I figured out the correct code. by Linda on June 14, 2016. Works perfectly (as a replacement to my original fan remote control). by Marshall on June 14, 2016.
by frederick on June 13, 2016. This was the perfect replacement for my Regency ceiling fan. All functions worked perfectly. Great buy!!! by Clyde on June 13, 2016. Great replacement for our hunter fan. I was a little concerned that it wouldn't work but like they said it was the replacement for out fan. Thank you for providing a great replacement remote. by Carmen on June 12, 2016. Is a good replacement remote for my fan but it does not have an upper and lower light button on the remote. I cannot turn the upper light on my fan off or on with the remote. Other than that, it works great. by dustin on June 11, 2016. It worked great!! I was thrilled because the other remote no longer worked. It's nice to have a fan again! Many thanks for making this remote! I'm happy I didn't have to replace the fan! by Tammy on June 11, 2016. Love the replacement remote. It works better than the original! by Penny on June 07, 2016.
by hector on June 06, 2016. Works exactly as advertised, even though I didn't get quite the correct one. That was my error, not the company's. by Clifford on June 06, 2016.
by dennis on June 05, 2016.
by Cynthia on June 05, 2016.
by scott on June 05, 2016.
by Wynette on June 05, 2016.
by Tony on June 04, 2016.
by America on June 04, 2016.
by Gage on June 02, 2016. Works great as a replacement for the original remote with all the functions. Good quality. by Robert on June 02, 2016.
by frank on May 31, 2016. Great replacement part and an ease to connect with the fan's remote unit. I give this a "+" for convenience and savings! by laura on May 31, 2016.
by Cameron on May 31, 2016. Excelente. Funciona muy bien. Gracias! by Ruth on May 30, 2016. Good product. Does the job exactly as expected. by marie on May 29, 2016. My remote arrived quickly and works perfectly! I'm very pleased. by Heather on May 28, 2016. Works great. All buttons work. Including reverse. Could not be happier. by Jeff on May 27, 2016.
by Yevgeniy on May 26, 2016.
by Guy on May 24, 2016.
by TIMOTHY on May 23, 2016.
by Dores on May 22, 2016.
by David on May 22, 2016.
by David on May 21, 2016. I went for months without being able to use the lighting on my ceiling fan. I finally found this remote and it has worked perfectly. 5+ stars for the remote and Replacementremotes.com. by Michelle on May 19, 2016. Great service, though it took several weeks before remote arrived. by Seth on May 17, 2016.
by Peter on May 17, 2016. Works awesome! Thought I was going to have to replace the fan but you save me tons of money. by Tammy on May 14, 2016. Every thing was satisfactory and it works just fine! by Robert on May 13, 2016. Works just like the original. Easy to program. by michael on May 11, 2016.
by Anonymous on May 04, 2016.
by Anonymous on April 24, 2016. Identified correct replacement - easy to order - arrived quickly - synced perfectly. Thanks. by Anonymous on April 22, 2016. Nice to know you can order a replacement remote for a remote that has been discontinued and the new product works fine ...and no programming needed!!! This was for my elderly mother who has a fairly old Hampton Bay ceiling fan in need of a new remote. by Anonymous on April 12, 2016.
the remote worked just like the original it was great. I would recommend this remote as a quality product that works just like the original. Great product. by Anonymous on April 07, 2016. Remotes are for my hampton bay ceiling fans. Exact replacemants. by Anonymous on March 26, 2016.
by Anonymous on March 10, 2016.
by Anonymous on March 03, 2016. We use the remote for our apartment ceiling fan. by Anonymous on February 15, 2016. Have been searching for a replacement remote for our 15 year old Hampton Bay fan--this works exactly like the old one. Price was better than other places also. by Anonymous on February 12, 2016. This was a replacment product and I will reccomend it my friends. got the remotes in and they worked as expected. will do business with them again. by Anonymous on November 16, 2015. Remote worked like a charm! by Anonymous on November 14, 2015.
by Anonymous on November 11, 2015. Very easy to navigate throughout the website. Cheapest prices I could find any where for this particular remote. Very fast shipping. Thank you so much! quick delivery.....exactly what I needed!! by Anonymous on October 28, 2015. Exact model required now obsolete but suggested replacement model works perfectly . Speedy delivery - excellent service, thank you. by Anonymous on September 28, 2015. No fussing around. I got exactly what I needed. Shipping delay was USPS mistake. Website was good. by Anonymous on September 26, 2015.
by Anonymous on September 20, 2015. Very good, fast shipping too, but light & fan still dont work, i might need to sinc the remote and light? But i dont know anything about electricy, so i may need to call in a electrician. 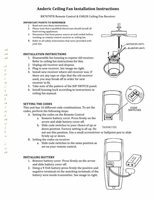 I use it to control a ceiling fan, the original remote was not working properly and hard to find a replacement in a store. by Anonymous on June 14, 2015. This product was a direct factory replacement for my ceiling fan and as soon as I popped in the battery it worked for the light and fan! Great product. 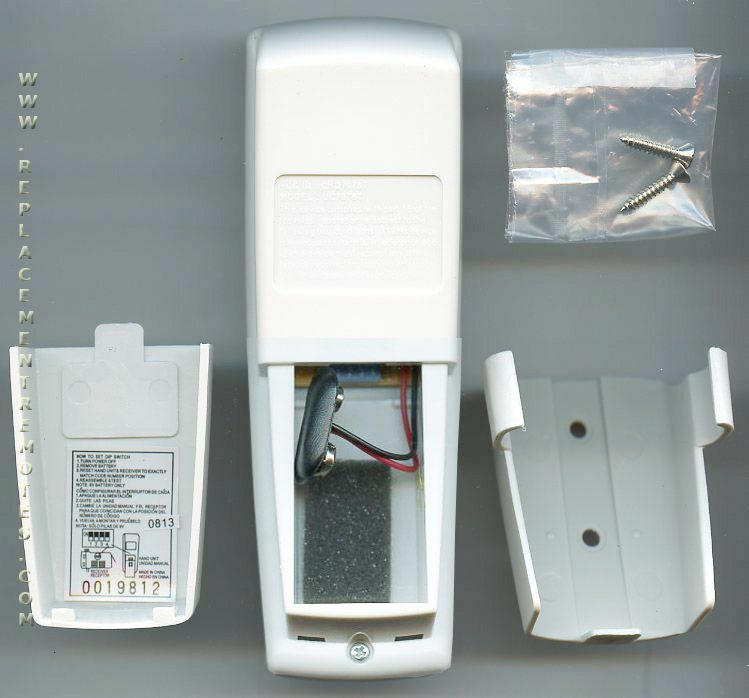 Great replacement for a very old (10-12 years) Hampton Bay fan remote for a Hampton Bay fan that came with built in wireless remote control, not a add on wireless conversion kit. Looks different but works exactly as the original remote did! by Anonymous on March 24, 2015.
by Anonymous on March 23, 2015. I have only just received the remote so hopefully it will have a long life. by Anonymous on March 20, 2015. Remote works the ceiling fan. I would recommend this to anyone needing a fan remote. Quality appears fine. by Anonymous on March 19, 2015. Remote for ceiling fan by *** but had to get a Anderic as replacement. Recommend this product. by Anonymous on March 11, 2015. We have this product in our bedroom.It is used to turn on the over head light (make it dark or light)or we could turn on the celling fan for air conditing. by Anonymous on March 07, 2015. Worked exactly as advertised and looks nicer than original remote. by Anonymous on February 26, 2015.
by Anonymous on February 16, 2015. Worked as advertised, replacement for original equipment. Seems to work well, I would recommend anyone with this light/fan that needs a new remote. The old one lasted about 8 years, but the button got hard to push and didn't always make the connection. The old model was replaced by this one and it is 100% compatible. by Anonymous on February 08, 2015. The remote to our ceiling fans was broken and had been discontinued by the manufacturer. Luckily, ReplacementRemotes.com had one that was compatible and worked perfectly when we received it. by Anonymous on January 19, 2015. It's doing exactly what we need. by Anonymous on January 17, 2015.
by Anonymous on January 12, 2015. The part replaced a fan remote control that was no longer working. The replacement part worked perfectly and was exactly what was advertized. I recommend using this company as their prices were the lowest available online. It was the correct replacement remote and it worked. by Anonymous on December 31, 2014. It worked just as soon as I put in the battery. It worked because it was the correct remote control not a substitution. by Anonymous on December 29, 2014. Easy to use great remote!! by Anonymous on December 17, 2014. I purchased a remote control for my ceiling fan as the other remote had broken. The new replacement I received works perfectly. It works better than the original. Needed a new fan remote as old one stopped working and the replacement turned out to be an excellent choice. Would recommend this product to anyone needing similar!! by Anonymous on November 20, 2014.
by Anonymous on November 19, 2014. After our dog chewed up the remote for our fan we ordered a new remote. The ordering process was very easy and the price for the new remote was very reasonable and we received the new remote very quickly. by Anonymous on November 14, 2014.
by Anonymous on November 10, 2014.
by Anonymous on November 06, 2014. We needed a new ceiling fan remote and they had it for a great price and it arrived super fast. by Anonymous on November 04, 2014. The replacement worked perfect with my very old ceiling fan. I love that I didnt have to replace the receiving unit in the fan. by Anonymous on October 21, 2014.
by Anonymous on October 06, 2014.
by Anonymous on September 28, 2014. Bought it as replacement remote for Harbor Breeze fan that has no controls except for the remote. Apparently this remote works with nearly all remote control fans. by Anonymous on September 24, 2014. I would recommend to any who needs remote control replacement. by Anonymous on September 12, 2014. I use it for my rec room. by Anonymous on August 27, 2014. The remote works so well. I could not believe how easy it was to program and it was compatible, just like the description said. by Anonymous on August 17, 2014.
by Anonymous on August 15, 2014.
by Anonymous on August 04, 2014. We ordered a replacement remote for a Hampton Bay overhead fan. It was an older model. The website was user friendly. I could easily identify the remote being replaced. It came very quickly in the mail. It matched up perfectly. Thanks for such good service!!! by Anonymous on July 29, 2014. Remote works great once the DIP switches are set! by Anonymous on July 12, 2014.
by Anonymous on June 30, 2014. The remote just needed me to add batteries to and it worked with my fan. Perfect replacement for my broken ceiling fan remote....I have already recommended this product to friends and family. by Anonymous on January 09, 2014.
everythingworked fine, i wouild recomend to anyone, my only issue is i damaged one of the holder upon installation and need to get another. i wish i could buy these things at a brick and morter. I would recommend the product to whomever need a replacement remote. by Anonymous on December 31, 2013. It is just like the original. Correct Product Works perfect like the original. Works with my Hampton Bay fan exactly as described. by Anonymous on November 30, 2013. It is a replacement for ceiling fan remote. I would recommend your service. by Anonymous on November 08, 2013. Product worked exactly as advertised. by Anonymous on November 03, 2013.
by Anonymous on October 02, 2013. I am SO HAPPY with this remote, thank goodness you have this for the older models of ceiling light fans! my old remote is the original (15 years) and the buttons just wore out from pushing them... this is perfect! Delivery was fast - thank you again so much!!!! by Corasue on February 27, 2019.
by Horacio on August 28, 2018.
by Michael W on August 19, 2018. Working great. Better than the original remote. This thing is great. Worked right out of the box. Also came with the wall holder which is a bonus. by Nelson on July 19, 2018.
by Victoria on July 06, 2017. I haven't figured out how to do it yet. I thought I could just put a battery in it and return it to the place where the other one was -- I will figure it out with the help of a neighbor unless you have some easy directions. by Mary on September 26, 2016. I purchased a pair of these remotes to replace the original ones that had been attacked by the dog. It was simple to get them working... just set the switches to match the old ones. Took about one minute, and they work great! by Jeff on July 21, 2016.
by Carl on July 16, 2016.